Dungeons and Dragons was created in the early 1970s by Gary Gygax and Dave Arneson as an extension of their tabletop wargame, Chainmail. The earlier game was about massed battles between armies of miniatures, initially focusing on historical events and then bringing in fantastical creatures and magic. Continuing the process, Gygax extrapolated out a game focusing on a smaller group, consisting of say 4-6 heroes, in which they went off adventuring. The original focus of the game were 'dungeon crawls', with the players exploring ancient ruins, killing monsters and disabling traps to gain both loot and 'EXP' or experience points. As the characters gained EXP levels they gained more abilities, became tougher and more difficult to kill and more skilled in evading traps. So were born the original D&D campaign settings, actually surprisingly quickly after the original game was released in 1972. Dave Arneson worked on a setting called Blackmoor (eventually absorbed into the later Mystara setting), whilst Gygax's home setting developed quite quickly as well. In his case, the elaborate dungeon (eventually amassing several dozen levels) was located underneath a location called Castle Greyhawk and its attendant city. 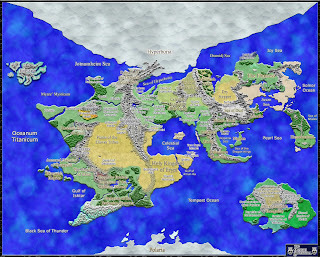 As the campaign progressed, the players seemed more reluctant to return to the dungeon and preferred getting involved in the politics and factionalism of the city itself, or exploring the countryside beyond its walls, including yet more dungeons (such as the formidable Temple of Elemental Evil) and other cities. With Gygax running several games a week as well as running TSR, the company publishing D&D material, there was no time for elaborate worldbuilding, so he based the map of the continent on one of North America, aligning Greyhawk with Chicago and its southern rival, Dyvers, with Minneapolis. As the campaign unfolded, the world of Greyhawk became home to many famous and powerful warriors, wizards and clerics, such as Mordenkainen, Bigby, Tenser, Melf (legendarily named because the player couldn't decide on an original name so went for Male+Elf) and Rary. As D&D itself was being developed and revised constantly at this time, these names found their way into the rulebook as spells such as Bigby's Crushing Hand, Tenser's Floating Disc or Melf's Acid Arrow, which survive pretty much to this day. 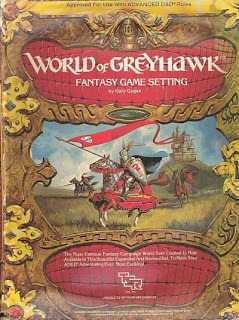 The 1983 World of Greyhawk boxed set for Advanced D&D 1st Edition. Greyhawk made its public debut in Dragon Magazine (then The Dragon) in June 1976, where Gygax was serializing a novella called The Gnome Cache. He revealed the setting was a world called the Oerth, which was similar to Earth, and mentioned the first Greyhawk deity, St. Cuthbert, in the following issue. An adventure published that year, Lost Caverns of Tsojcanth, was also nominally set in the setting. Gygax had no plans to publish the entire setting himself, feeling that players were more interested in creating their own worlds to play in, and was surprised when fans kept asking him about it. In 1978 Gygax finally relented, and many more adventures set in Greyhawk emerged (such as Tomb of Horrors and The Village of Hommlet, which introduced the Temple of Elemental Evil), along with a novel, Quag Keep, written by respected SF author Andre Norton. In 1980 TSR published a folio set called Greyhawk. Gygax had taken his original, North America-based maps and drawn a new landmass around them which became known as the Flanaess, the eastern third or so of a vast continent called Oerik on the world known as the Oerth ('Oi-th', pronounced as with a strong Brooklyn accent, according to Gygax). The setting was hugely popular and led to a deluxe box set called The World of Greyhawk, released in 1983. Unfortunately, Gygax began an acrimonious withdrawal from TSR around this time, and as part of the separation agreement TSR retained ownership of the Greyhawk setting and all its characters, something Gygax later came to regret as he saw his world developed in a manner he was not impressed with in later years. In 1988 the Greyhawk Adventures hardcover book was published, which was a more cohesive single-volume guide to the setting and brought the history of the world forward by some years. However, TSR had become more invested in its Dragonlance and Forgotten Realms settings and Greyhawk was not properly revisited again until 1991, when the Greyhawk Wars board game was published. This game saw the continent being torn apart in a huge, game-changing war. The subsequent From the Ashes boxed set reintroduced the setting as a D&D game world but, despite some good reviews, was not a huge success. Although a few additional materials leaked out, the setting looked like it had been abandoned for good. Despite this, there were a few last bursts of activity. In 2000 the new, 3rd Edition of the Dungeons and Dragons game was published by new owners Wizards of the Coast. The game was a huge success, and eagle-eyed players were surprised to learn that the game had a 'default' setting which was Greyhawk. The Greyhawk gods were named the 'default' gods of the game, and Greyhawk-specific items and locations were mentioned here and there through the core rulebooks and many of the earlier adventures. A very brief guide to the setting was also published, as well as 3rd Edition reprints of earlier Greyhawk adventures, such as the Temple of Elemental Evil super-adventure. It looked like Greyhawk had been brought back into the fold for good, but it was not to be. WotC decided to make Greyhawk the setting for their collaborative, massive 'living campaign' world, Living Greyhawk, a newer version of the Living City and Living Jungle mass-campaigns for 2nd Edition (both set in the Forgotten Realms). Run by the RPGA Network, this was effectively a pen-and-paper based version of online games such as the then-popular Ultima Online and Everquest, and the later World of WarCraft. Whilst the game was successful, with several thousand players signing up and playing regularly, it was also notably non-canon. It also absorbed the resources of all the Greyhawk material planned for 3rd Edition, meaning that for people not interested in the Living Greyhawk setting, no new stand-alone material was published after 2001, whilst WotC concentrated on Forgotten Realms and a new setting, Eberron, although a single adventure, Ruins of Greyhawk, did creep out in 2007 as one of the final 3rd Edition game products. WotC shut down Living Greyhawk in late 2008 as D&D 4th Edition was launched. The future of Greyhawk has not been outlined, but a recent 4th Edition game product made mention of several major worlds: Toril, Eberron, Athas, Krynn and Oerth, the worlds of the Forgotten Realms, Eberron, Dark Sun, Dragonlance and Greyhawk settings respectively. With the Realms and Eberron already back in print as 4th Edition settings and Dark Sun planned for next year, it seems inevitable than Greyhawk will return as a 4th Edition setting, probably in 2011 or 2012. Fanon map, although drawn from canon materials, of the whole Oerth. The setting for the Greyhawk campaign is the world known as Oerth, which is an Earth-sized planet consisting of one large supercontinent known as Oerik and several smaller landmasses, namely the jungle continent of Hepmonaland, the polar continent of Telchuria, and an unnamed, remote landmass in the southern hemisphere. 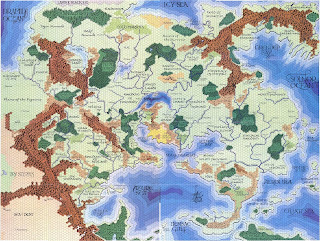 Gary Gygax's original plan was to develop the whole planet in a reasonable amount of detail, but virtually all of the published gaming materials to date focus instead on the eastern third or so of Oerik, a region called the Flanaess. The Flanaess is a heavily and traditionally Medieval European-inspired land of temperate zones, feuding city-states (the city of Greyhawk being the most well-known), powerful kingdoms, cloistered dwarven cities, remote elven lands and so forth. According to Gygax, Middle-earth was not a strong influence, instead claiming to have been more influenced by the likes of Fritz Lieber, Roger Zelazny, Robert E. Howard and Jack Vance. Humans are more or less the dominant species, but dwarves, halflings, gnomes, elves (and their dark brethren, the drow), giants, orcs, goblins, kobolds, dragons and many other races exist in the setting. Gygax ruled that gunpowder and all of its associated developments does not work on Oerth, thus apparently trapping planetary technological development in the pre-industrial age permanently. The Flanaess, the main setting of the Greyhawk world. Greyhawk was developed as a place for lots of individual adventures rather than a massive over-arcing story, but the actions of Gygax's original characters did give rise to a metaplot of a kind. The original 'main' storyline saw various small nations and parts of the Great Kingdom attempting to break away, with varying degrees of success. After Gygax's departure, TSR decided to go for a larger, more epic story in which the evil demigod Iuz attempted to conquer the rest of the world and the other nations of the Flanaess united to stop him, with a few other power groups (such as the Scarlet Brotherhood) attempting to further their own ends during the chaos. By the time the Greyhawk Wars had ended some of the established borders had changed and some kingdoms had risen or fallen. The later TSR and Wizards material is notable for emphasizing Iuz as the prime force of evil in the world, whilst earlier material focused more on local conflicts and problems caused by an evil deity called Vecna. Vecna was transposed to the Ravenloft setting during the TSR years, but made a return to Oerth during the Living Greyhawk era, and is likely to be a major villain in the hypothesized fourth edition of the setting (since Vecna is listed as one of the core deities of the 4th Edition game as well as a Greyhawk-specific deity). For areas beyond the Flanaess, not much is known. A miniature game called Chainmail (as a nod to the original miniature game which inspired D&D) was under development in 2001 set in Western Oerik, in a region called the 'Sundered Empire', but this game was canned barely before it could get on the shelves and was replaced by the much more generic D&D Miniatures game, and very little material about Western Oerik made it out, and what did appear largely unimpressed the fanbase (since, among other things, it broke the no firearms restriction). Whilst I've bought a few Greyhawk products over the years and one of my friends still has a copy of the 1983 box set in good condition, the setting has never really grabbed me. I came to it far too late, many years after first getting hooked into Dragonlance and Forgotten Realms, and it lacked the much more original flair of Planescape and Dark Sun. In the 3rd Edition era, Greyhawk's most laudable feature was its emphasis on lower-level adventuring, with very few major and powerful NPCs of the setting being over 20th level, and this was a major change from the very high-magic Forgotten Realms setting, where the number of NPCs over 20th level was frankly ridiculous and there were a significant number over 30th. Greyhawk's old-school, more restrained atmosphere was its most distinguishing feature during this time. However, whilst Greyhawk itself is a rather generic cod-medieval setting, its place in the historical pantheon of roleplaying settings is assured, as is its huge influence. Whilst the world itself may not be fantastically original, many of its dungeons and adventures, such as the terrifying Tomb of Horrors (Gygax recommended players roll up several characters for the dungeon, since some would inevitably die in the process of exploring it) and the vast Temple of Elemental Evil, not to mention the immense dungeons of Castle Greyhawk, are still popular today (if often transposed to other settings), whilst Vecna and Iuz are classic, old-school bad guys. With a 4th Edition version of Greyhawk almost certainly on the way, it will be interesting to see how Wizards of the Coast emphasize the setting's differences from Dragonlance and Forgotten Realms in order to hook new players in. Next time, we visit Krynn, the homeworld of the most feared and reviled creature in all of Dungeons and Dragons, the original Jar-Jar himself: Tasslehoff Burrfoot! Never actually played the game in any incarnation but do have a few of Gygax's Gord the Rogue books which I absolutely love. Gygax ruled that gunpowder and all of its associated developments does not work on Oerth, thus apparently trapping planetary technological development in the pre-industrial age permanently. How does that work? Is there something magical preventing the ignition of nitrate, sulfur, and charcoal? Are the ingredients rare to non-existent? Do they just not combine, and what effect does that have in terms of other types of chemistry? Nitpicking, of course, but it's arbitrary stuff like this that always fascinates me - I'd be interested to see an author who actually explores the implications of a world where gunpowder does not work for whatever reason, and what effect this has on the rest of the world in physical terms. As for pre-industrial age, does steam power not work on that planet? Or water-driven power? Do his medievalesque civilizations have wind-mills or water-mills? My D&D days were mostly in the Greyhawk-free period of the nineties, although I did play a couple of 3e games in the setting. Personally, I found it fairly pointless, since it was immensely generic and had few interesting features. The lack of everybody running around with high-power artifacts and godlike abilities was refreshing - but better to play your own setting, frankly. @ Brett, I think the idea is that the laws of physics on Oerth simply prevent combustion working like that, or gunpowder simply doesn't exist in the same format. I think it was more a case of Gygax wanting nothing more lethal as a ranged weapon than a crossbow or longbow, so he just ruled out guns and that was it. The (meta)physics behind gunpowder not working, I am not privy to. However, there is one character that did have functional six-shooters. Murylund. One of the WG series modules (or was it EX) explained why they worked. I think it was one of the EX modules either Adventureland or Land Beyond the Mirror, but not positive. Donations to the Wertzone help cover costs and support the site. A British science fiction and fantasy fan of film, books and computer games. A Culture movie in the works? Looking for reviews of THE GATHERING STORM?